A Parallel Stream which runs with the commercial cinema and tries to diminish the thin line in between always deserves certain accolades. Of course it takes quite a genius to be able to achieve that, but all said and done, a cinema based on socio-cultural-economic issues and to get it to be a box office hit; has to be an Aamir Khan. To portray the agony of loosing a child, of blaming self for not being there when needed, of just slipping, being careless when you could have been; how does one justify the amount of pain it takes? To speak about the tremendous pressure of soul, conscience? I knew a Saaransh which happened years ago and a Daddy, and Anupam Kher dealing with the loss. The helpless pain, which he depicted, guilt-ridden eyes, slumped shoulders, he was a Father to a Lost Child. Talaash brings the search of that Father back to me! There are many layers to the movie, characters, situations, sequences, songs- but what stays with me is still that Father. Critical acclamations, updates and people trying really hard to not associate with this perspective, conclude it as a Suspense Thriller (?). Some still living the post-Ghazini era have not been able to associate with any Aamir movie which released after that, go looking for a similar action. Lest its an easy excuse of living in ignorance, and not trying to relate to an emotion which makes you go a little wobbly in knees or softens up those hard edges a bit. That its Perfectly Normal for a Man to Cry, Its Okay for Him to Mourn the Loss, and That it makes An Absolute Sense when there is a Guilt which makes him Sleepless at Nights. Of the Times when He would like to Express the Pain and He is not Able to Say It. Talaash brings the search of a Wife to me too, as she tries to bring back the Husband, she lost with the Death of Her Child. The Restless Incomplete Soul, which Lives with her. And while she quietly attends the Psychiatrist sessions arranged for her by him, she affirms that he is the one in Dire Straits. That she has come out more strongly than him. 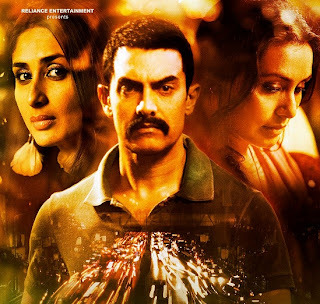 Talaash brings the search of a Girl Lost in a Market of Crushed Lives. Of a Girl stepping Out Every Night Searching for That Something or Somebody who would Rescue Her from the Hell-Hole. Reema Kagti has fine-tuned her works basing them closely on human relations, so while Honeymoon Travels Pvt Ltd was an example of Progressive angle of looking at a Marriage; Talaash has just proved to be another Feather on her Hat ! Etched against the Dark Alleys of a Red-Light Area, Super-Natural Powers, Crime Streets, Night Clubs, I see a Movie which is again very Mature for its Times. First published as a Facebook Note by Aarini Sharma.